Established in the year 2000, the WNYC Archives are the stations' physical link to its rich and storied past. Directed by Andy Lanset, an archivist and audio preservation specialist, the department provides a central repository for thousands of audio recordings, photographs, memorabilia, reports, news items, program guides, institutional records, and promotional materials. Among its holdings are more than 70,000 recordings in a variety of formats, from early lacquer and acetate discs, to reel-to-reel tapes, to digital audio tapes and compact discs. The archive staff also includes Archive Manager Marcos Sueiro Bal and students from library and archive academic programs. The department was a long time in the making for WNYC. Prior to its founding, no central repository for archival station material existed, and, as a result, items were spread throughout many departments within the station at its previous location in the Municipal Building; eventually, a centralization project consolidated storage to a dozen rooms on three floors. Now, in our facility on Varick Street, all our collections are conveniently stored in one temperature- and humidity-controlled room next door to the archive office/lab, featuring compact moveable shelving. Additional items are in a climate-controlled storage in New Jersey. The great bulk of our physical assets has been cataloged thanks to a grant from the Corporation for Public Broadcasting, through its American Archive Project. 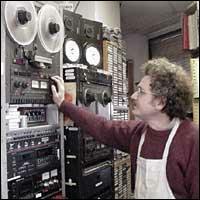 Most contemporary digital assets (broadcasts and podcasts) can be located by searching wnyc.org, while the archives catalog are publicly accessible through the American Archive of Public Broadcasting. Links to nearly 3,800 streaming WNYC and WQXR audio files can also be searched through the Digital Public Library of America. Important older items continue to turn up. For example, the department has acquired key Patricia Marx interviews from the 1960s and hundreds of Readers Almanac shows, as well as a large collection of WNYC music programs produced and hosted by Edward Tatnall Canby. The department repatriates WNYC material from outside collections, such as those at the Library of Congress, the National Archives, the Smithsonian and the University of Maryland, as well as from former producers. With the acquisition of WQXR in October, 2009, the archives has also added WQXR materials from their previous broadcast library as well as from former producers. Original WQXR materials and copies have also been added from other institutional collections. Together, we are now known as the New York Public Radio or NYPR Archives. Despite its modest staffing and physical resources, the WNYC Archives has helped document numerous aspects of WNYC's history while keeping it all in a secure place. "Now that we're in the new Varick Street facility, I don't have worry about the air conditioner breaking down or about leaks whenever it rains," says Lanset. "So we can concentrate our time and energy organizing, digitizing, and helping producers to get what they need." Do you have any WNYC-related items? We are always searching for programs, recordings (disc or tape), photos, programs guides, and promotional material. The Archives remains closed to the public, but you can reach us by phone at: 646-829-4381 or by e-mail at alanset@nypublicradio.org. Among the biggest responsibilities of the department is maintaining this vast library of audio recordings. Here's a snapshot of how it all works, WNYC Preservation and Archive Process.